Despite losing the toss, despite losing their debutant fast bowler to injury, and with the other fast bowler struggling for rhythm, with hardly any turn or seam movement available, India still managed to strike three big blows before lunch. Once again, West Indies swung madly between ultra-aggressive and ultra-defensive batting as opposed to just playing, to just let their natural batting take over in good batting conditions. The day began positively for West Indies. Jason Holder was back, he called correct at the toss, Kraigg Brathwaite got two gifts on the pads in the first over, and then Shardul Thakur walked off with a groin injury in only his second over. It is worth noting Thakur came back from the Asia Cup with a groin injury, which should raise more questions about India's handling of injuries. The rest of India's session, though, put these uncomfortable thoughts behind. R Ashwin and Kuldeep Yadav controlled the scoring and were rewarded with a wicket each. Kieran Powell continued his extremely attacking approach, stepping out to Ashwin and hitting him over mid-on second ball. Eventually played a shot too many, and chipped Ashwin to extra-cover for 22 off 30 balls. Despite that early boundary, Ashwin only conceded seven runs off his 10.2 overs. At the other end, despite scoring eight runs in the first over, Brathwaite couldn't even get singles away. 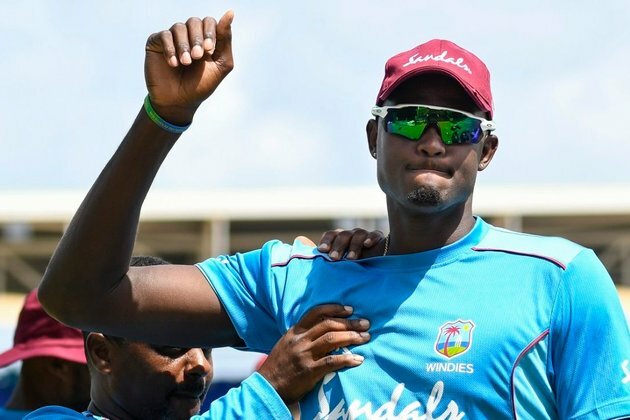 By the time Kuldeep trapped him lbw - wrong'un followed by the stock delivery coming back into him - Brathwaite had added 6 off 62 balls to his first-over eight. With a slightly older ball, Umesh Yadav found his rhythm, bowling accurately and getting inward movement. There was one explosion off the pitch too. Eventually, with what turned out to be the last ball before lunch, the only West Indian batting at a natural pace, Shai Hope, was trapped lbw.